It’s November 26, which means I’m scrambling to finish NaNoWriMo and whip up a Thanksgiving dinner before the sun sets tonight. You know what that means… Time for a classic Caterpickles. I reached into the Caterpickles Way Back Machine and pulled out this one from August 27, 2012 for your holiday enjoyment. See you when the turkey’s gone! 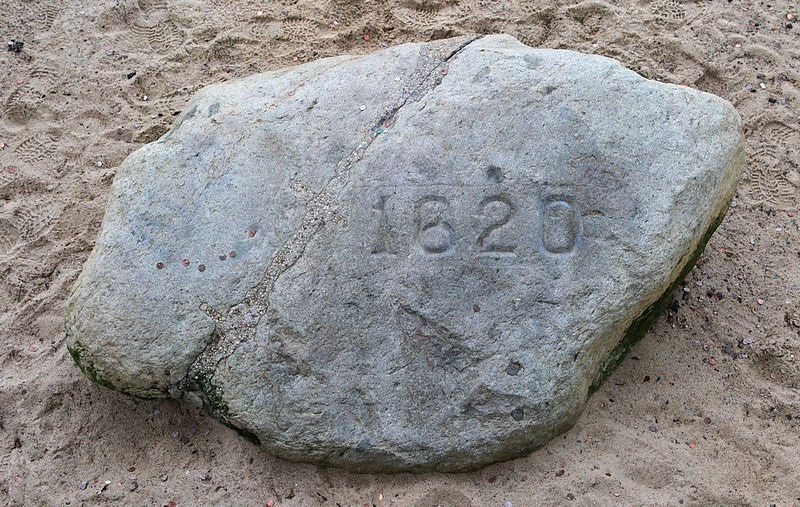 Turns out Plymouth Rock has a great deal of traditional weight behind it, but little else. History tells us that the Pilgrims actually landed at Provincetown in Cape Cod in November 1620, and only moved to Plymouth Harbor some weeks later. That alone makes it extremely unlikely that Plymouth Rock is literally the first rock the Pilgrims stepped on when they landed in the New World. 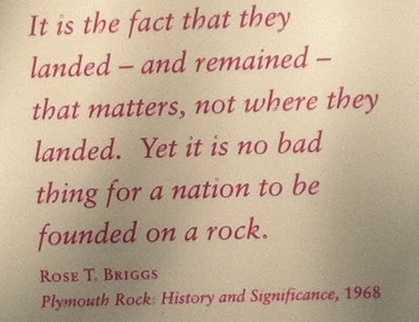 Adding insult to injury, as the sign at the Plymouth Rock monument points out, contemporary accounts of the landing say nothing about a rock at Plymouth. Plymouth Rock makes its first appearance in historical accounts of the landing in 1741, some 121 years after the fact. On the other hand, Plymouth was the Pilgrim’s first permanent settlement in New England. And that is the key point. When Plymouth’s town leaders decided to build a wharf at the original Pilgrim landing site in 1741, it was only natural that they would consult 94-year-old Thomas Faunce about its location. Although Faunce was not himself a Pilgrim, he was descended from one. Just as importantly, he had served as the town’s record-keeper for most of his adult life and was expected to know these sorts of things. In fact, Faunce did have something to say on the subject. He led the town leaders to a rock that his father had told him was the first solid ground the Pilgrims had set foot on. I suppose we’ll never know whether Faunce neglected to add the qualifying phrase in Plymouth when he identified the original landing site or whether the town fathers chose to overlook it (Plymouth Rock was a mere 650 feet from town, making it a far more practical spot for the historic Plymouth wharf than the actual landing site in Provincetown would have been). However convenient the rock’s original location may have seemed in 1741, by 1774 it was deemed too far from town. So Col. Theophilus Cotton split the rock in two, leaving the bottom half at the wharf and taking the top part to the town’s meetinghouse. The top half of Plymouth Rock rested at the town meetinghouse until 1834, when it was relocated to Pilgrim Hall. In 1859, the Pilgrim Society decided it would be best to build some sort of canopy over the part of Plymouth Rock that remained at the wharf. The canopy was completed in 1867. 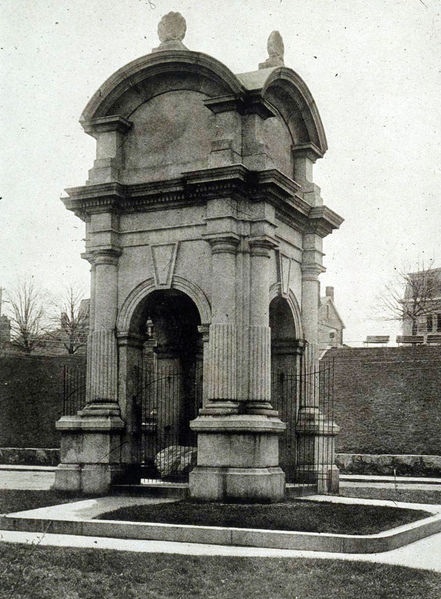 When the Plymouth waterfront was redesigned in 1920, the architects moved Plymouth Rock to sea level and replaced the edifice over the rock with the current portico. That’s because it is. The original Plymouth Rock is thought to have weighed 20,000 pounds. According to the sign at the Plymouth Rock monument, what we see today is a mere third of the original rock. Looting accounts for much of the loss. According to Wikipedia, by 1880 one-third of the top half of Plymouth Rock had been chipped away and sold for souvenirs. Most of the looting happened on the rock’s various trips back and forth through town en route to its current resting place. Can’t make it to the wharf? You can find other pieces of the rock in Pilgrim Hall Museum in Plymouth, the Plymouth Church of the Pilgrims in New York City’s Brooklyn Heights, and in the Old Patent Building at the Smithsonian in Washington, D.C (more commonly known as the National Portrait Gallery and the Smithsonian American Art Museum). Could care less. I’m more interested in the blunderbuss.